Featuring 3 well-appointed bedroom suites designed to embrace keener aspects of Balinese culture, the villa is a testament to the scintillating beauty of wood and natural materials. 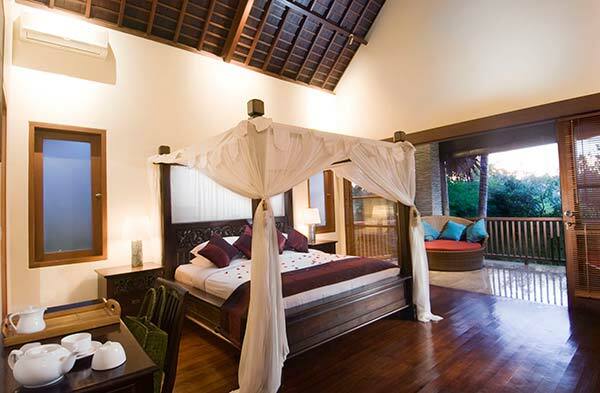 Villa Bedroom One is centred by a traditionally carved Madura king-size bed which doubles as a day bed for casual lounging. The en – suite bathroom features marble flooring and walls, a splendid hot and cold shower, washbasin, and toilet. Amenities like bathrobes, bedroom slippers and a set of Villa Baladewa Empat signatures amenities are designed with your greater comfort in mind. Villa Bedroom Two is situated on the second of two levels, which form a separate unit conjoined to the main villa area. The bedroom extends outwards to a spacious balcony and recreation area, offering an elevated view of the villa’s natural surroundings. 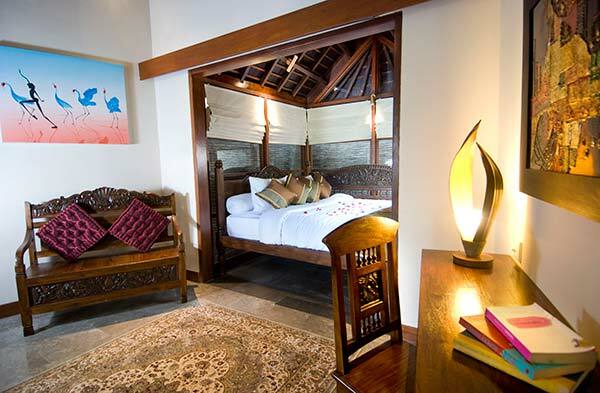 Designed in sensual red and black hues, with stellar teak wood furnishings and a four-poster bed, this bedroom is ideal for honeymooning couples or those seeking greater privacy from the outside world. The third bedroom suite faces the garden and features customized Balinese furniture against a luminous black and gold palette. 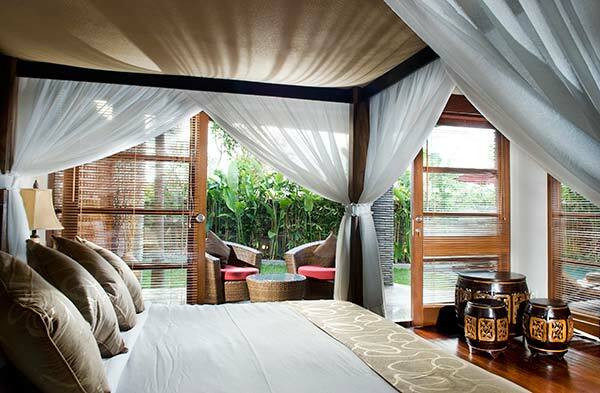 A sumptuous four-poster bed and expansive outdoors lounge area are ideal for quiet nights spent in the villa. Both Bedroom Two and Three feature en-suite bathrooms with well-appointed sunken baths, hot and cold showers, washbasins, and toilets. There are walk-in wardrobes in both suites for greater privacy, as well as a set of Villa Baladewa Empat signature bath and body toiletries.